1. A two-wheeled, one-horse carriage that has two seats and a folding top. 2. An automobile with a folding top; a convertible coupe. 3. Etymology: French from cabriole, "leap of a goat, caper"; from cabrioler, caprioler, "to leap like a goat, to caper"; from Italian capriolare, from Latin capreolus, diminutive formed from caper, "he goat", whence capra, "she-goat". 1. A double star in Auriga, the brightest star in the constellation, approximately 46 light-years from Earth. 2. Etymology: from Latin, diminutive of caper, "goat". To leap or to skip around in a sprightly manner; to prance; to frisk; to gambol. 1. A reference to a goat. 2. Of or pertaining to a special acid or its derivatives: Capric acid comes from animal fats and oils which are used in the manufacture of perfumes and fruit flavors. The capric acid also occurs in small quantities in butter, coconut oil, etc. ; which is united with glycerin. Capric acids are colorless oils, or white crystalline solids, of an unpleasant odor similar to goats or sweat. A tendency to make quick, impulsive decisions or changes of the mind: A caprice is a sudden mental conclusion that is made apparently without adequate reasoning or consideration. 1. Relating to or indicative of a whim or irrational thinking; erratic: Shirley's such a capricious mother that her son doesn't know how she'll react when he tells her that he and his girl friend are engaged. 2. Characterized by or subject to impulsive and unpredictable behavior: Although we may enjoy a little unpredictability in life now and then, the term capricious is not ordinarily used in a positive sense; for example, a capricious wife can make a nervous wreck of her spouse. 3. Etymology: from Latin caput, "head" + riccio, "curled" or "frizzled". The root of capricious is the noun caprice, which means "a whim' or "sudden change of mind" and caprice ultimately came from the Italian word capriccio, which also has the meaning of whim and at this point hedgehogs enter into the research of the etymology. Hedgehogs are known for their spiky, spiny coats and the Italian capriccio is a combination of capo, "head" and riccio, "hedgehog", and its original meaning was "hedgehog head", a description of someone so frightened or astonished that the hair on his or her head "stood on end". The transformation of the meaning of capriccio from "fright" to "whim" or "sudden impulse" seems to have involved another group of animals; namely, goats. While the Italian word capra, "goat", is not directly related to capriccio, the similarity of the words and the skittish, flighty behavior of goats apparently gradually pushed capriccio away from "fright" and towards "whim". 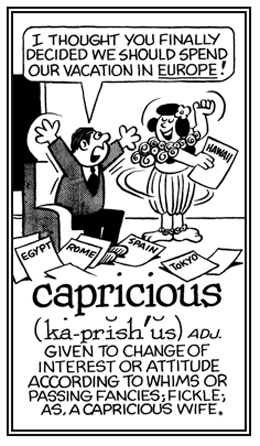 By the time "caprice" entered English in 1667, it meant simply "whim, erratic", or "notion". Little, Brown and Company; New York; 1990; page 96. Springfield, Massachusetts; 1989; page 86. Descriptive of changing often, erratically, and impulsively: The spring weather has been capriciously going from relatively bad winds and icy conditions to even more severe and destructive situations. Constance capriciously purchased and exchanged five dresses in one week at the local department store. A situation where a person makes statements or decisions which are not fully analyzed or supported by reason: Joan's capriciousness was revealed when she invested her entire savings in stocks that lost a significant amount in value; thus, decreasing the amount of money that she had in her bank account. 1. In astrology, the tenth sign of the zodiac, represented by a goat with a fish's tail and extending from December 22 to January 19. Capricorn is classified as an earth sign, and its ruling planet is Saturn. 2. In astronomy, a faint zodiacal constellation in the equatorial region of the southern hemisphere, lying between Aquarius and Sagittarius. 1. Conveying a goat or of the goat kind. 2. Etymology: from Latin caprigenus; caper, "goat" + gegnere "to produce". Of or pertaining to, or derived from, a goat; goat-like. Related goat-word units: aego-; hirco-; tragico-.